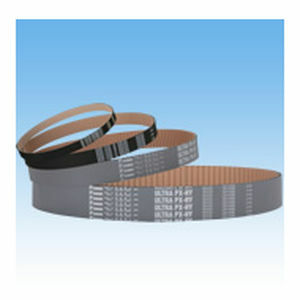 HY Type Ultra PX Belts use a hybrid core of carbon and glass for dramatically increased strength and durability. Tsubaki pursued maximum performance to bring even higher load transmission and longer life to its belts. Enables high transmission performance by using a hybrid core with specially treated high rigidity carbon and glass fiber. It has 1.3-2.0 times the transmission performance of HC Type Ultra PX Belts, allowing for more compact and lightweight equipment. Hybrid core provides less load elongation. High speed and high load transmission are possible. It also greatly shortens damping time and maximum amplitude for faster equipment speeds.